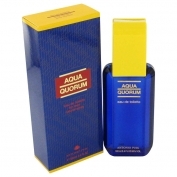 Aqua Quorum is an aromatic - fougere, fresh aquatic fragrance launched in 1994. Top notes: lavender and freesia. Heart: geranium and grapefruit. Base: amber, leather and oak moss. Available as 50 and 100 ml EDT. Aqua Quorum was created by Alberto Morillas, Harry Fremont and Rosendo Mateu.